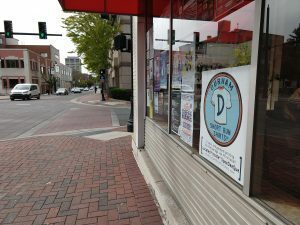 Durham Short Run Shirts t-shirt printing : Print local! 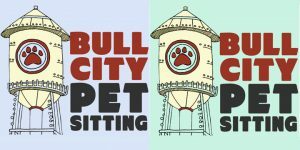 We’re now located in the vast metropolis of downtown Durham NC! Find us *inside* SpeeDeeQue Printing, at 301 E. Chapel Hill St at Foster St.
Stop on by! We’re in the shop regular office hours 9-5. Our operator Madge may be on the phones (she’s very diligent about handling the phone calls) but she’ll say Hello, or at least wave. She’s friendly like that. Now! Shirts for sale in the front of the copy shop! DSRS original designs on t-shirts, reasonably priced, for you to purchase (need a good Christmas gift idea?) come see what we have! Our “Shelf on the Elf” shirt returns this season, along our new “Green Means Go” design in youth sizes, and our Southern Jedi line. No image or logo? No worries! We can create one for you with our design/illustration services. specialty shirt ideas for everyone! Trying out a brand? Consulting available if you need just a little bit of help in figuring out all the details for your print project, it can be overwhelming at times (whew!). 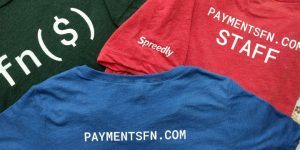 We print t-shirts and sweatshirt hoodies, pocket and tag prints, tote bags and long sleeve shirts, as well as aprons and tea towels. Need a poster printed for an event? We can do that, too. Great customer service & friendly staff. Give us a ring! Contact us info@durhamshortrunshirts.com Our operator Madge is standing by. Oh, yeah… we’re in Durham NC. Print local! 301 E. Chapel Hill St. Recently used Durham Short Run Shirts for a batch of 20 shirts for a friend’s fundraiser. I had screen-ready art, and the whole process was really fast and easy. Jamie was quickly responsive to all my questions and everything went off without a hitch, including hand-delivery to me at my office! 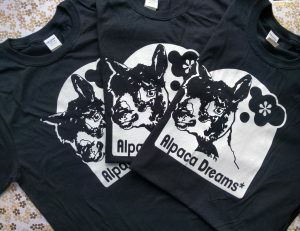 The shirts look fantastic, real screen printing is so nice. Jamie recently created a design for team shirts for a local run for me. The design was perfect and the whole team loves the shirt. 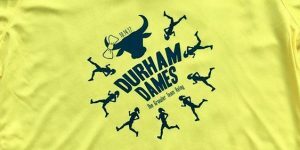 I will definitely go to Durham Short Run Shirts for any t-shirt needs! Durham Short Run Shirts is fantastic. Their work is high quality and the service is unbeatable. I’m so grateful they are here in Durham. We do a good deal of printing for shirts and sweatshirts. Finally having a reliable go-to is such a relief! Jamie was really patient with me as we were working out the details. The shirts were completed when promised and look fantastic. And it feels great to support another local small business! Durham School of the Arts “Battle of the Books” t-shirts. Copyright © 2019 Durham Short Run Shirts.